Find this amazing Toojay’s Coupon in your mail today! 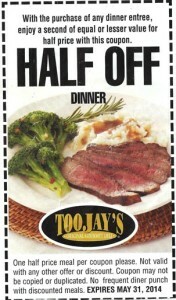 With the purchase of any dinner entree enjoy a second of equal or lesser value for half price with this Toojay’s Coupon. Half Off Dinner. One half price meal per coupon. Expires May 31, 2014. So redeem this now at their nearest Toojay’s Location while it lasts. Have a fine dinner for half off any entree and enjoy the night. Toojays Coupon shown for your convenience.